NATICK, Mass. (June 7, 2016) -- U.S. Army shelters perform well on land, but that just may be the tip of the iceberg, or rather the tip of the floating ice sheet. The Army Natick Soldier Research, Development and Engineering Center provided shelter support to the Navy during its biannual Ice Exercise in the Arctic Ocean. 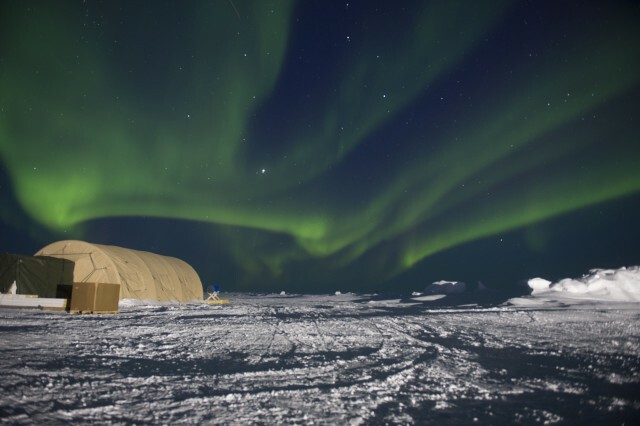 NSRDEC shelters were used as part of a temporary station on a floating ice sheet during the exercise called ICEX. The Navy used the NSRDEC shelters for billeting, diver exercises and emergency shelter. The U.S. Navy's Arctic Submarine Laboratory is the lead organizer for the arctic exercise, which is held by the Navy as a way to research, test and evaluate operational capabilities. During the exercise, Ice Camp SARGO serves as a temporary command center, including shelters and other infrastructure to support the exercise. "ICEX is the U.S. Navy's RDT&E exercise used to validate and assess operational readiness of the submarine force in the Arctic, while continuing academic research and military training in extreme cold conditions and the undersea environment of the region," said Theodore Goda, the Navy's ICEX Program Manager, at the Undersea Warfare Development Center detachment Arctic Submarine Lab. "Every two years the Navy holds an event to basically look at their Arctic readiness and to do some evaluations of the projects and equipment," said Clinton McAdams, Science and Technology Strategic Integration lead at NSRDEC. "The shelters they've used in the past typically took a week or two to set up, so the Navy reached out to us and asked if we had something they could set up more quickly. We were able to get them our TEMPER air-supported shelters." NSRDEC provided the Navy with shelters featuring airbeam technology. Natick was one of the pioneers of airbeam technology, which consists of inflatable, high-pressure arches. The arches replace metal frames in tents and can be deployed rapidly. The airbeams come in small, lightweight packages. Large shelters and shelter complexes can be set up quickly and with fewer personnel than metal frames. Also, in the case of a storm, airbeam shelters may be safer than metal or wooden frame shelters, because the airbeams tend to bend and pop back up rather than break apart or collapse. "I saw this as a great opportunity for our shelters to be utilized and evaluated in an extreme environment by the Navy," McAdams said. "This opportunity also allowed us to showcase some of our products to a whole new audience while we gained valuable information on new ways our shelters can and will be utilized in the Arctic." "NSRDEC provided multiple airbeam shelters and forced air heaters that were tested to operate in Arctic conditions," Goda said. "At ICEX 2016, the Arctic Submarine Laboratory was able to conduct an operational assessment of the form, fit and function of the shelters and heaters. The shelters were used for berthing, watch standing, and to support training and RDT&E projects on a shifting ice floe approximately 200 (nautical miles) north of Prudhoe Bay, Alaska. Of particular interest to ASL was the capability to deploy the airbeam shelter rapidly with minimum manpower and equipment requirements." John Viggato, Assistant Product Manager for Shelter Systems, Product Manager Force Sustainment Systems, or PM FSS; Ariana Costa, Program Integrator, NSRDEC's Expeditionary Basing & Collective Protection Directorate, or EB&CPD; and NSRDEC's Primo Borelli traveled to the Arctic to help with the setup of the shelters. The Navy was pleased with the ease of setting up and using the shelters as well as their performance, particularly given the extreme cold and wind. "The U.S. Navy's Arctic Submarine Laboratory is grateful for the collaboration with the U.S. Army's Natick Soldier Research, Development and Engineering Center on shelter and heating capabilities for the austere arctic environment of Ice Exercise 2016," Goda said. 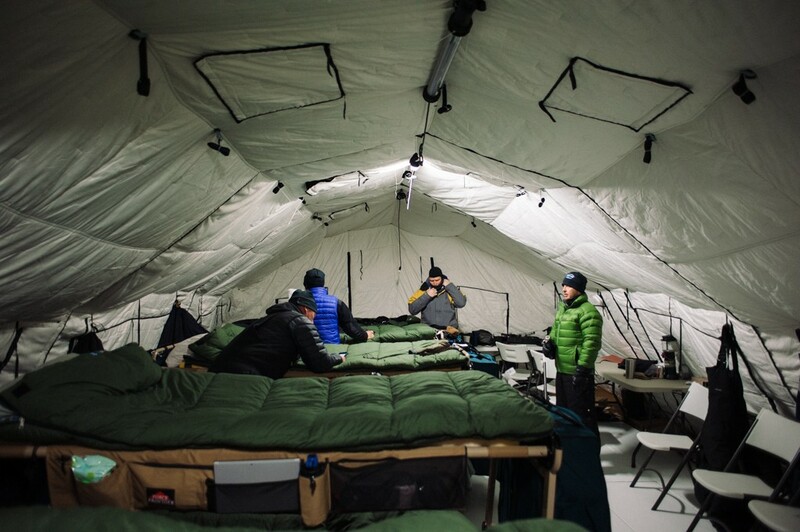 "The airbeam tents and forced air heaters performed well in conditions exceeding minus 20 degrees Fahrenheit, minus 45 degrees Fahrenheit wind chill, and 25 knots wind gusts." "The structures were used for billeting as well as a base of operations for the four dive teams that were on site," said Viggato. "A hole was melted in the ice for the divers to enter, and the shelter was placed on top with the floor removed. This provided the dive teams with a warm, safe environment in which to surface and prepare for their dives." "For us, it is the first time that I know of where we have had anything like this where we are on sea ice and where we had search and rescue divers using it (the shelter) to go in and out of the water," McAdams said. "The divers were practicing search and rescue underneath the ice. They basically used one of the shelters as a warm bay and one for an unmanned underwater vehicle and then they had one for billeting and emergency overflow." In addition to providing shelter support for the Navy, NSRDEC and PM-FSS evaluated new camouflage netting. "We evaluated a number of camouflage prototypes in support of the Ultra-Lightweight Camouflage Net System modernization effort," said Viggato. "PM FSS has a new requirement to upgrade this legacy camouflage system, and we used Ice Camp SARGO as an opportunity for an initial look at snow pattern camouflage. We observed these prototype nets with visual cameras, as well as near-Infrared, Short-Wave Infrared, and Long-Wave Infrared sensors. The results were promising, and the team learned quite a lot about full-spectrum performance in this unique environment." NSRDEC's support of ICEX helped ASL carry out the exercise as well as build the foundation for future collaboration. "The members from NSRDEC and PM FSS who went up to Ice Camp SARGO were able to gain firsthand knowledge of some of the difficulties an ice camp presents in terms of basing," said McAdams. "By us sending TEMPER air-supported shelters, we were able to allow the Navy to set up the camp quicker and be able to start mission tasks more rapidly than they have been able to in the past. I see this as a great opportunity for EB&CPD and the U.S. Navy ASL to collaborate and for us to evaluate shelter technologies in an extreme arctic environment in the future." "We learned a lot and were also able to make some recommendations to them for future ICEX events," said Costa. "We are planning for them to visit us soon to learn more about the technologies NSRDEC has that would assist them, including options from Combat Feeding and Airdrop." "The airbeam shelter was paramount to the Arctic Submarine Laboratory meeting its objective of overnighting on the ice starting on the first day of ice camp build-up, a first for the ICEX Program," said Goda. "The airbeam tent performed well in all aspects of the operational test." "This event was a great opportunity for us to experience the unique environment the Navy operates in during this exercise," said Costa. "We were happy to see that the airbeam shelters performed well in such extreme conditions." "While this was an excursion into an entirely tent-based camp, it was extremely successful and we look forward to additional collaboration with the Navy in future years," said Viggato. "It was a once in a lifetime opportunity that was truly eye opening to conditions of the Arctic," said Borelli. "I would go back again in a heartbeat."